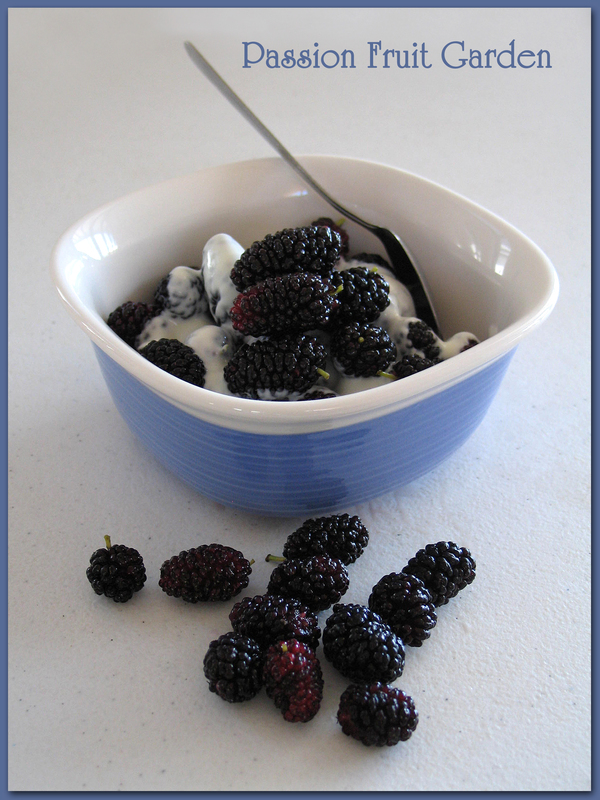 Is a bowl of mulberries with home-made yoghurt. I have had a mulberry tree for ages. Notwithstanding it looks very sick, it produces mulberries each year. For some reason, the birds around here don’t like mulberries. It may be because they are not particularly tasty but with some home-made yoghurt and vanilla syrup, they are tasty enough for an enjoyable breakfast. Are my bottles of vinegar. I promised to keep you updated. Here is the link to my April 2013 IMK. See how the colour has changed? If you look at the top of the jars, you can make out a black line and the date 22 March 2013. This was the level then. It is interesting to see how much it has evaporated. I also had one small bottle which I decided to strain to see if it tasted any good. It didn’t, so I put it back in the bottle. It subsequently went mouldy so I am not touching these guys. Are two jars of expectant (in my dreams) mothers. Because my vinegar is not faring the best, I decided to try to make a mother to help it along. My first attempt was an idea I got from Maggie Beer. She advised to put some sourdough bread in a jar with some wine … and wait. Well, I waited a month or so and all I got was a jar of wine-soaked bread so I threw it out. Maybe I was too impatient but I don’t think so. The jar on the left is Bragg apple cider vinegar (see the photo below), local still dry cider and a few strands of tagliatelle (It was supposed to be spaghetti but, as luck would have it, I didn’t have any). The jar on the right is Bragg apple cider vinegar, some wine Maus didn’t like and tagliatelle. The cider is made from freshly crushed apples. According to the label, it has no additives, no preservatives, no sulphurs and no apple concentrate. Things normal cider has in them. The vinegar is made from organic apples, is raw and unfiltered and contains the mother. It was these words that caught my attention. 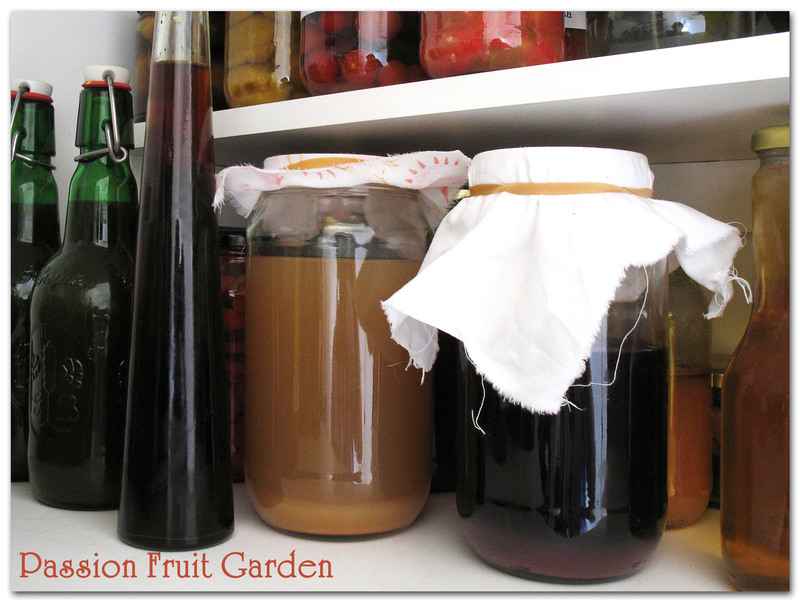 I got the idea for the vinegar from Lisa, the Gourmet Wog’s blog. She featured it in her last In My Kitchen post. According to Lisa, it is very good for you. I couldn’t believe my luck when Maus found it in the local health food shop. 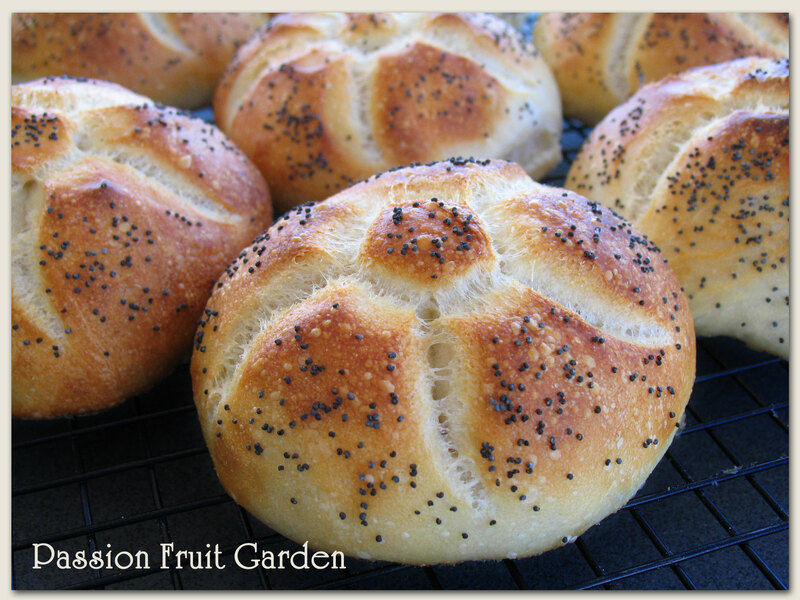 Joanna, from Zeb Bakes, sent me links on how to make a mother. I noticed a comment by Joanna on Misky’s blog to the effect that she had no vinegar brewing at the moment and, immediately, I was asking her questions galore. She was given a mother so she didn’t have to make hers from scratch but she was very helpful in sending me links. I might try Maggie Beer’s idea with the sourdough bread, wine and some of the Bragg’s vinegar. I still have my keg of wine in the pantry that I also featured in my April 2013 IMK post. Nothing seems to be happening with that either. Poor me, I will keep trying. Are 15 bottles of olive oil from this year’s harvest. I bottled these yesterday, ready to hand out to friends and rellies. We had a great harvest, more than we can use in one year, but since then I thinned out the trees quite significantly and olives are known to have a light year after a good one, so maybe next year’s harvest won’t be as impressive. Are my new bread stamps that Celia sent from Sydney. She has some and regularly show cases them on her Blog and, of course, I wanted some, too. For my first try, I used a very simple baguette recipe from Local Breads by Daniel Leader – 340g tepid water, 1 tsp instant yeast, 500g bread flour and 1½ tsp salt. They tasted and looked fabulous. I made 120g balls (after checking out what Celia used – she uses 125g, but 120g was a better division for the amount of dough I had). I thought the rolls were a bit big for the cutters so I will try 100g next time. I know, I know, Celia has a spiral one and I haven’t. Chef’s Warehouse didn’t have any the day Celia bought these. Don’t worry, I am going to Sydney next year and hope to remedy the situation. Was some oat and sultanas slice. I used to have a great recipe for this slice but lost it. In an endeavour to resurrect it, I made Merle’s (Merle Parish Merle’s Kitchen) Rolled Oat Slice (adding ½ cup of sultanas) but it was too dry (even with much more butter than the recipe called for). Then I made the Australian Women’s Weekly’s Honey Wholemeal Slice, but it had too much honey in it which made them soft. I have printed out another recipe from the web which I may try. If anyone has a tried and true recipe, I would love it. 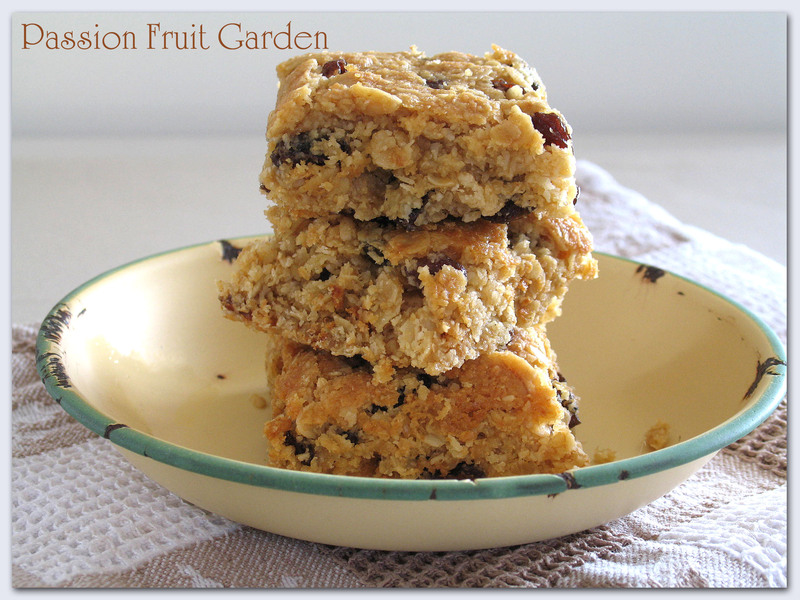 The ingredients are: butter, honey, sugar, coconut, oats, sultanas and flour. Clearly, the portions are critical. 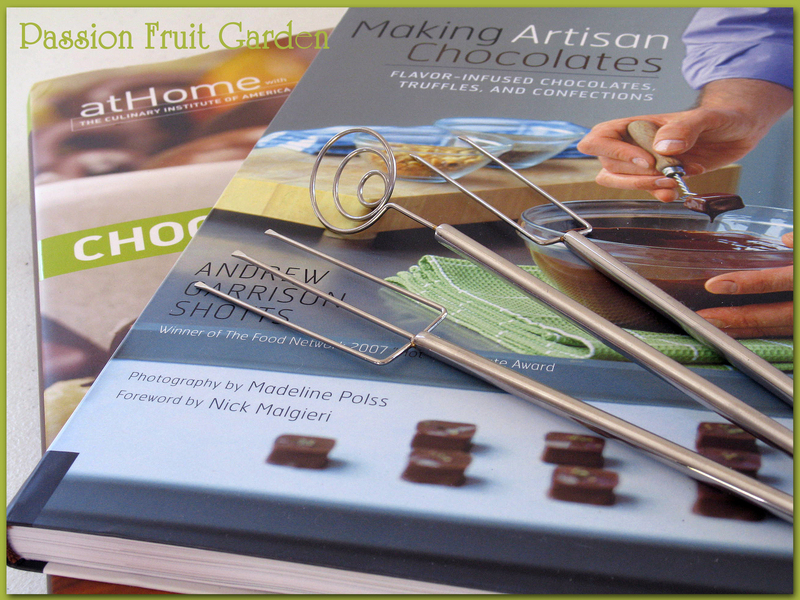 Are my new chocolate dipping forks and two chocolate cook books. I bought all from Amazon. I think Chocolate and Confections by Peter Greweling is particularly good, not withstanding the use of corn syrup in every recipe. I just substitute liquid glucose. The quality of the little forks is impressive and they weren’t particularly expensive. I can’t wait to try tempering again. Maus has been giving me hints about the lack of sweets in the house but I told her she has to eat more barazeks before I make any yummy stuff. Yep, we still haven’t eaten the mountain I made in August. I would like to try another version from Suzanne Husseini’s Modern Flavors of Arabia but not until the current mountain is diminished. Is my new syringe. Maus bought it for me from Horseland. I saw one being used to squeeze chocolate into moulds and thought it was an idea worth trying. Again, when all those barazek have gone! Is my new butter dish. It is Sarah’s Garden by Wedgewood. It is so pretty. 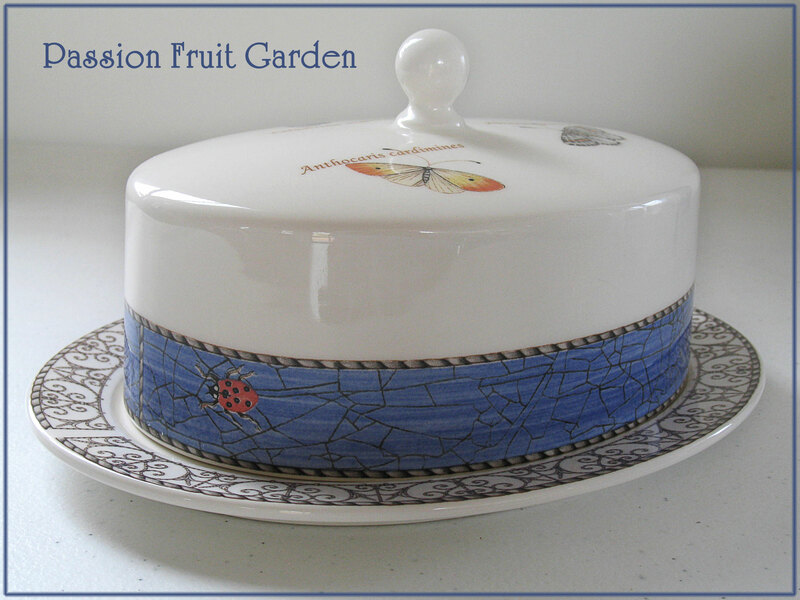 The original Sarah’s Garden china was made in England. It was released in 1997 and discontinued in 2006. When my mum died, I bought quite a lot of Sarah’s Garden to remind me of her as she was a great lover of china. 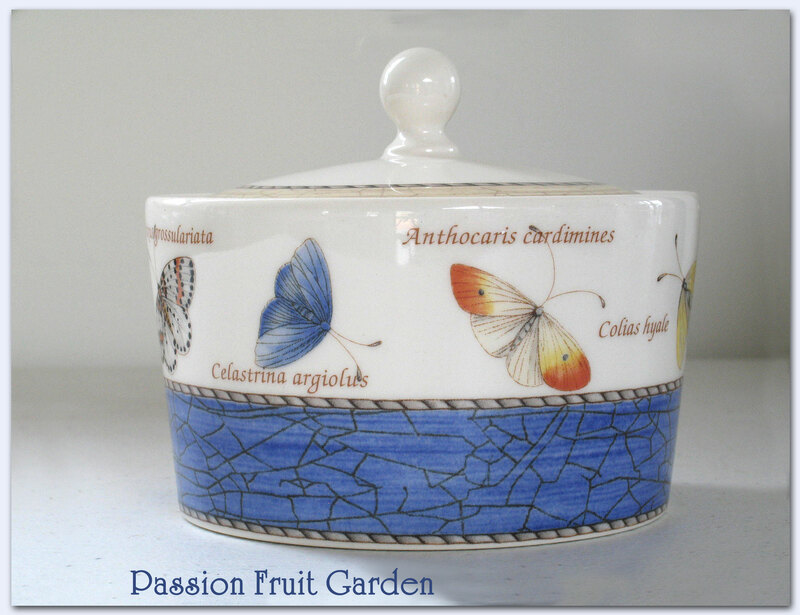 A few years ago, Sarah’s Garden china started reappearing. The new stuff is made in Indonesia. When you check the bottom, it does not say where it is made. Very naughty. My new butter dish matches my sugar bowl that Colette bought me one Christmas. We keep our tea bags in it. 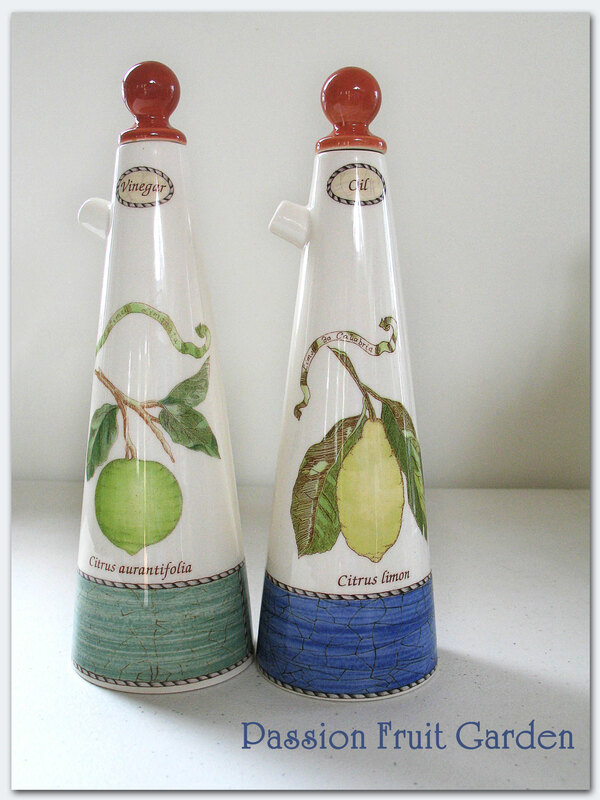 Are my vinegar and oil cruet set. They are part of my original purchase in 2002. They have ‘Made in England 1997’ on the bottom. The other two items don’t. This entry was posted in Homemade Produce, In My Kitchen, Vinegar and tagged Bread stamps, Homemade vinegar, Sarah's Garden Wedgewood, Sulatanas and oat slice, Syringe for ouring chocolate into moulds, Vinegar mother by Glenda. Bookmark the permalink. I love that you are trying to make your own vinegar. It is on my list of things to try. And so I have good news for you 🙂 I am in Perth, I have a mother stashed away that I am happy to share and I feel sorry for you 🙂 The reason the Bragg’s apple cider vinegar is soothing is because it is lactofermented, so it is alive with probiotic bacteria that are great for your gut. A little a day is great for you. Love everything else going on in your kitchen. Hi Tania, thankyou so much. I am in Perth today and tomorrow. If that is not convenient for you I will be back in Perth in about a fortnight. Where in Perth are you? I love Sarah’s Garden too but stopped buying it. It’s all very pretty but there’s only so much of it you can have. My crowning glory is an enormous Jelly Mould. I love it but it makes a lot of jelly…. Thanks for your amusing vinegar trials and travails. I enjoy following to see what happens. Hi Fiona, Too much Sarah’s Garden? I don’t think so! My vinegar is very sad, one day I hope to have a happy tale to tell. I had to go back to see how your vinegar making mission began – you are one very determined lady! I’m so jealous that you are able to make your own olive oil. Here in Massachusetts, we’re very limited on what will grow because of our winters. Those rolls look perfect to me but I am really admiring your Wedgewood. The pattern is really beautiful & I guess I never really checked closely but I think I saw some a little while back in an antique store nearby. I should check that out again although I’m sure it didn’t stay for sale very long. Hi Diane – that day of pressing grapes was traumatic indeed 🙂 Olive trees do very well here. We have about 50 trees so we will have oil galore in the future. Wow, 50 trees is a lot! You must have enough to supply the town. We have what’s called a wild olive here in New England which is good for absolutely nothing. Because they grow so fast, years ago the state decided to plant them along the median strips along the highways & they’ve taken over so now they’re in the process of pulling them all out. There’s a couple on our property that are getting out of control which are pretty until they take over. I Diane I think I know the variety you are talking about. Do they have really small leaves? Yes and they’re a b*tch to rake up. Isn’t mulberry season the best! I was luck to get some from our trees before heading overseas this year. Everything in your kitchen this month looks absolutely beautiful – thanks for sharing! Isn’t Mulberry season the best – I can’t get enough of them. I was luck to get some off our trees before heading overseas this year. Everything in your kitchen this month looks absolutley stunning, as usual!! Thanks so mu h for sharing. Mrs Mulberry, I should have known you would like mulberries!! Oh Maureen You have Charlie, what more could you want? Hi Tandy. They are a lot of fun. Like Mandy I remember coating myself purple eating mulberries off my grandparents tree. Yours look lovely with the yoghurt & vanilla syrup. The wine did taste odd. Hi Glenda, I could have sworn I had popped a comment on your post…. there’s so much happening in your kitchen. You are a very clever cook! Hi Liz. Thanks so much. I read that you are on sick leave again. I hope you are feeling better. Hi Glenda, what a beautiful selection on your kitchen, I thought I was browsing an online shop and kept looking for the order now button 🙂 Bread stamps look brilliant I’m not that great decorating with a Stanley knife. And I’m going to have to read more about your olives, what a great harvest! Hi Jason Thanks for all your compliments. G’day Glenda! Love your bread stamps and they will be on my list to find now too! Love your butter bowl and how warm and welcoming your kitchen is always to view! Congrats re your oil harvested! Hi Joanne. Those bread stamps are fab. They come from Chef’s Warehouse in Surry Hills. I’m stunned there is so much going on in your kitchen. I don’t know how you keep up! We’ve just come back from Sicily and I swear when we win the lottery we are buying an olive oil grove. How amazing to be able to cook with your own oil – I am jealous beyond words. Hi Nancy, It is pretty cool. The best thing is, you can use extra virgin, cold pressed olive oil in everything!! Lol. I love that Maus bought you a syringe from, of all places, horseland. I buy syringes for my horse (they’re great for flushing out wounds and various other things), but never from horseland – I always get my stash from the chemist!!! I hope your vinegars come through! Oh, now I want some of those bread shaper things! Hi Emma, They are wonderful. Go get them! Hi Glenda, I have a recipe for oat bars which I have used for years, originally off the back of a sugar packet, I think it is the one you want. Shall I email or post it in comments? Hi Madge, Thankyou so much for that. Could you email it to me? My email address is pfgarden@optusnet.com.au. I will make it tomorrow! I love that you are trying to make vinegar! I also once made it by accident. And it wasn’t the best vinegar I’ve ever tasted either! 🙂 I’ll take an 18 year balsamic vinegar over it anyday! Lovely Glenda! The roll stamps and the rolls look wonderful. 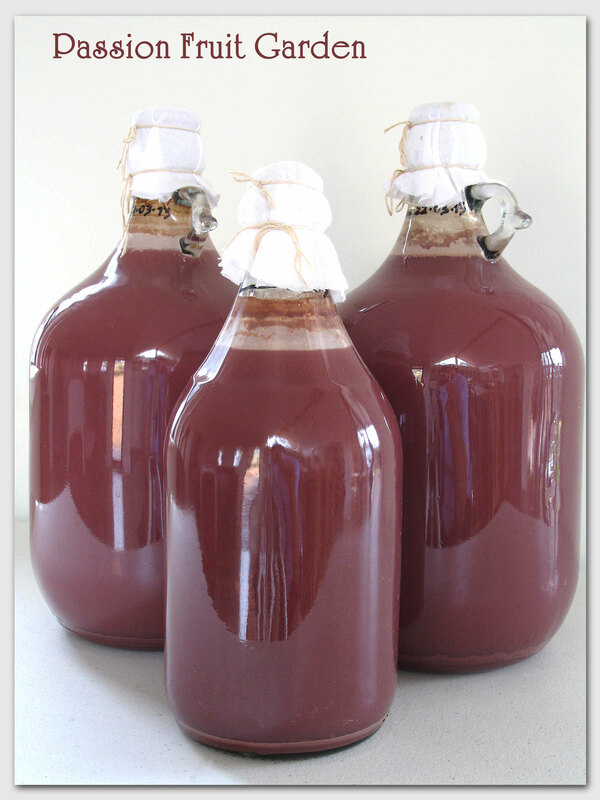 I made vinegar a couple of years ago, we have a small oak cask in the windowsill right now. Once I dried out the mother and it felt like a piece of leather. Good luck with your vinegar, it can be finicky. 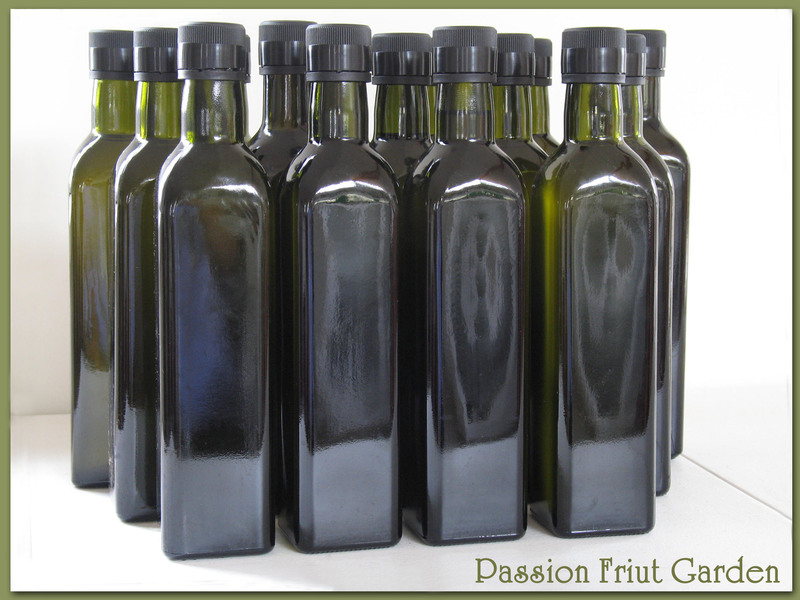 Producing your own olive oil must be great! How lucky you are! Great In My Kitchen activities! Hi Pamela. Why did you dry out the mother, was it to store it for later use? If so did it come back to life.? I don’t know why I am asking these question, I don’t even have one. 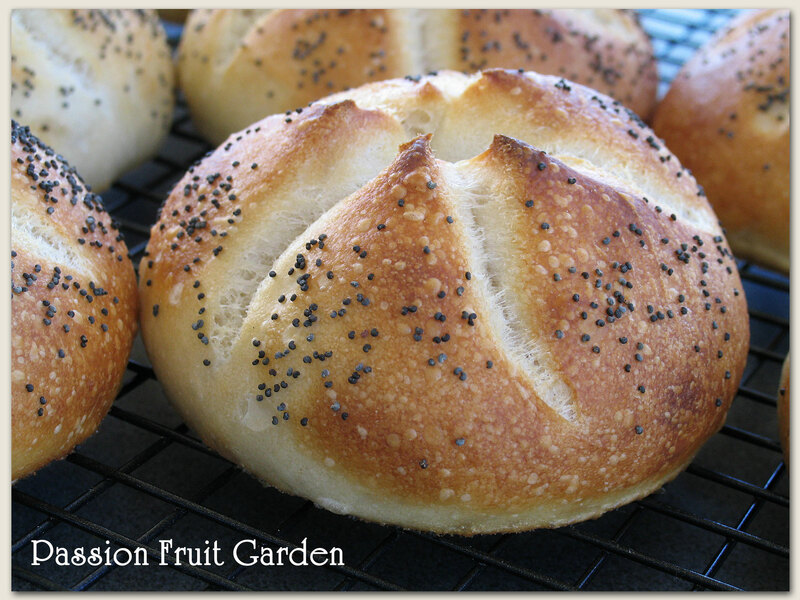 Your rolls look fab and how wonderful to press your own olive oil. I’m making vinegar too – must be the ‘in’ thing to do – but I’m just making it by adding some vinegar with the mother to a bottle of our cider. Wish I was going to have mulberries and yoghurt for my breakfast tomorrow. Anne, that is what I am doing. How long does it take to do something and when do you know it has? So many wonderful things in your kitchen again this month Glenda but all the way through reading all I could think about were your mulberries. I have the fondest memory from childhood standing barefoot under my granny and grandads huge tree in their back garden eating mulberries straight from the tree and got my little fingers and feet stained from the ones that fell to the ground. Hey Mandy, I was just commenting on your blog. My mulberry tree is not like the huge ones people remember from their childhood. Mine is small and spindly but it still produces a crop every year. Nah, I bet it was huge. Hi Lisa Barazeks, barazeks! How many can a woman eat? Fingers crossed for the vinegar. I always have a chuckle at how so many of us have ‘projects’ going. I made vinegar once by accident when some fruit wine ‘went off’. I was told it was caused by fruit flies getting in but I always doubted that. I love your Wedgewood. So pretty. And as for growing your own olives ~ well I’m speechless with envy! Hi Celia, I was just going through my comments and noticed I hadn’t replied to you. I am so sorry. I don’t want you to think I don’t love you 🙂 In fact, I do remember responding, maybe it just got lost. Anyways. I am interested that the vinegar is stomach soothing. Do you do what Lisa does, a teaspoon a day … ? 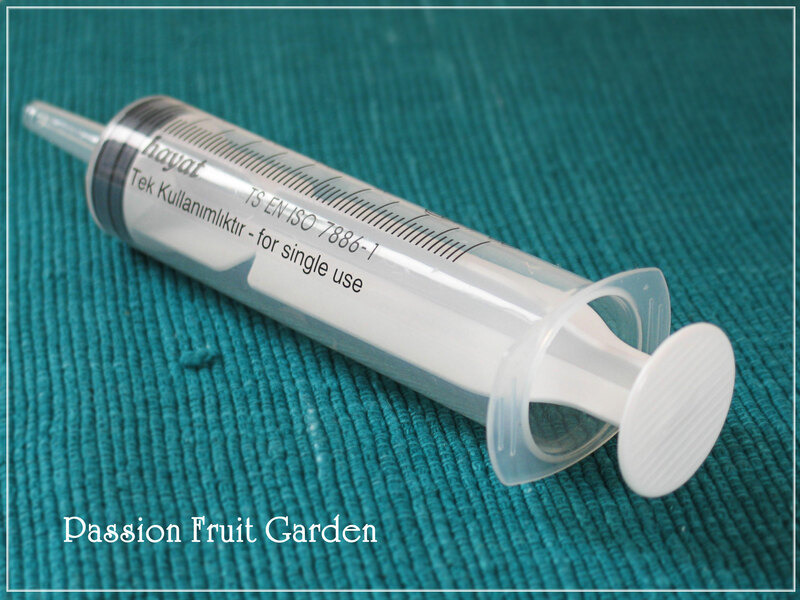 I am sure to make a mess with the syringe. Oh well, more to eat. I have friends in France who always make their vinegar – but like you mentioned they have a starter or mother so I’m impressed at your attempts as it’s not easy to keep going. And could I just reach over and take one of those bread rolls – I’m sure you wouldn’t miss just the one!